Planit today announces that it has been named one of the area’s top workplaces by The Baltimore Sun. The Baltimore Sun partnered with WorkplaceDynamics, an employee survey firm, to determine the region’s top places to work. Earlier this year, The Baltimore Sun encouraged its readers to nominate their companies as top workplaces. Nominees were then administered confidential employee surveys that covered topics ranging from company values, growth opportunities, office culture, leadership, compensation and benefits. A total of 100 companies were recognized as a Top Workplace, with Planit ranking 39 in the small employers category. “So often we look at corporate America and it’s beige. We don’t want that at Planit. We are in the business of inspiring people, and in order for our employees to do that, we have to give them the space and the resources they need to create great work,” said Matt Doud, president and co-founder of Planit. “To be named a Top Workplace based solely on employee feedback is further validation that we’re doing something right.” Planit is currently looking to hire account supervisors, social media supervisors, interactive designers and web developers. To learn more about career opportunities and internships at Planit, visit http://www.planitagency.com/careers. WorkplaceDynamics conducts regional Top Workplaces programs with 37 major publishing partners and recognizes a list of 150 National Top Workplaces. Over the past year, more than 5,000 organizations and one in every 88 employees in the U.S. have turned to WorkplaceDynamics to better understand what’s on the minds of their employees. Planit has just announced a partnership with the Economic Alliance of Greater Baltimore (EAGB). The EAGB has tasked Planit to develop a new marketing campaign and positioning platform for the greater Baltimore region that will instill a greater sense of pride in the people that live and work in the area and inspire outsiders to move here, start a career and expand or launch a business. The EAGB is a not-for-profit economic development organization led by a partnership of regional business executives, elected government officials and leaders from higher education with the vision to gain global recognition for the greater Baltimore region as a world-class market. The EAGB promotes regional economic development by marketing, partnering, creating business retention, thought leadership, and business attraction. “Our agency has a tremendous amount of pride in Baltimore, but unfortunately this region has been burdened in recent years with a reputation that often overshadows all the greatness the area has to offer,” said Ed Callahan, executive creative strategist and co-founder at Planit. “We are excited to spearhead an initiative that will get people talking positively about Baltimore and help retain and attract businesses and residents to the region.” Planit will create a marketing and positioning platform for the city and the six surrounding counties to promote the region as a world-class destination. The campaign will highlight many reasons why the Baltimore-area is a great place for individuals and businesses to grow including its nationally recognized healthcare system, growing cyber industry, recreational and arts offerings, educational opportunities and unique, diverse neighborhoods. “Our companies, our institutions and our people drive our vibrant, regional economy and it is time we celebrate our success. Other markets covet what Baltimore has to offer and we want to amplify the great story we have to tell,” said Economic Alliance Board Chair Mike Baader, managing corporate partner at Venable. The goal of the campaign is to enhance the profile of Greater Baltimore and foster economic development by articulating the growth opportunities for businesses and employees alike. “The Baltimore region has long been reluctant to boast about its success and take pride in all it has to offer. Planit is going to help us change that,” said J. Thomas Sadowski, president and CEO of EAGB. “We have great minds, important history, world-class amenities and charming communities. As a home-grown business themselves, Planit understands the message we want to convey and we’re looking to them to help us inspire others to live, learn grow and invest here.” The campaign, created collaboratively by those who live, work, learn and invest in Baltimore, will officially preview at EAGB’s annual meeting on December 11. To learn more about the meeting and to purchase tickets, visit http://www.greaterbaltimore.org/events/annual-meeting.aspx. About the Economic Alliance of Greater Baltimore The Economic Alliance was created to serve as a not-for-profit economic development organization led by a partnership of regional business executives, elected government officials and leaders from higher education focused on fostering business retention and development, job creation, workforce development and new investment throughout the greater Baltimore region. The association has the mission of marketing greater Baltimore as a world-class region in which to live, work, learn and invest. To find out more about the association you can visit the website at http://www.greaterbaltimore.org/. 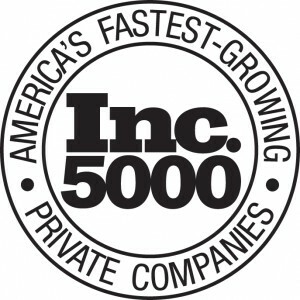 Planit is pleased to announce that it has secured a spot on the 2013 Inc. Magazine 5000 List of fastest growing companies in the United States. Now in its seventh year, the Inc. 5000 is the most comprehensive portrait of America’s fastest-growing private companies assembled anywhere. The list is ranked according to percentage revenue growth when comparing 2009 to 2012. To make the cut, companies must have been founded and generating revenue by March 31, 2009, and have revenue no less than $2 million in 2012. Additionally, they had to be U.S.-based, privately held, and independent not subsidiaries or divisions of other companies as of December 31 of the last year measured. Planit holds the position of 3,162 on the Inc, 5000, and now shares a pedigree with Intuit, Zappos, Under Armour, Microsoft, and dozens of other notable recent alumni to the Inc. 5000 list. Complete results of the Inc. 500/5000, including company profiles and an interactive database that can be sorted by industry, region, and other criteria, can be found at www.inc.com/5000. Planit is pleased to announce that it has secured a spot on the 2013 Inc. Magazine 5000 List of fastest-growing companies in the United States. “The Inc. 5000 was harder to get into this year than ever in its history,” according to Eric Schurenberg, Editor in Chief of Inc. Magazine. “The average honoree grew a mind-boggling 468 percent. Those are results most businesses could only dream of in the economy of the past three years.” Now in its seventh year, the Inc. 5000 is the most comprehensive portrait of America’s fastest-growing private companies assembled anywhere. The list is ranked according to percentage revenue growth when comparing 2009 to 2012. To make the cut, companies must have been founded and generating revenue by March 31, 2009, and have revenue no less than $2 million in 2012. Additionally, they had to be U.S.-based, privately held, and independent not subsidiaries or divisions of other companies as of December 31 of the last year measured. “Earning a spot on the Inc. 5000 list is an impressive achievement,” said Matt Doud, president of Planit. “This award is clear affirmation of our explosive growth these past few years, and it validates our status as a nationally recognized agency with a kickass reputation within our industry.” Planit holds the position of 3,162 on the Inc, 5000, and now shares a pedigree with Intuit, Zappos, Under Armour, Microsoft, and dozens of other notable recent alumni to the Inc. 5000 list. Complete results of the Inc. 500/5000, including company profiles and an interactive database that can be sorted by industry, region, and other criteria, can be found at www.inc.com/5000. Planit recently launched a new and improved website for local salad dressing, marinade, and spread company Tessemae’s All Natural. The most noticeable improvement to the site is the overall look and feel, in addition to the enhanced shopping experience. Planit incorporated Shopify, a web-based eCommerce platform, into the site so that the entire transaction remains on the site and shoppers have the option to save their information for repeat purchases. Tessemae’s has grown exponentially in recent months, adding a multitude of new flavors to the lineup. With 53 products now available for purchase, Planit added categories and search functionality to the site to enhance the buying experience and offer opportunities for shoppers to view items they wouldn't have originally thought to buy. In the first week after the new site launched, online sales more than doubled from the previous week. Tessemae’s All Natural got its start in Annapolis, Maryland, when Teresa Vetter, a mother of three, needed something delicious to encourage her family to eat their vegetables. Instead of giving them a store-bought dressing full of preservatives, she set out in the kitchen mixing up her own recipe using fresh, all-natural ingredients. Years later, eldest son, Greg, took it upon himself to bottle the dressing and take it to market after being hounded by friends and family for the recipe. The product line is now available in Whole Foods Markets and used in restaurants across the region. On July 11, 2013, Planit launched a new website for the PBS KIDS Writers Contest that pushes the envelope from both a design and a development standpoint. The contest itself is an annual competition held nationally for kids in kindergarten through third grade who want to write and illustrate their own stories. PBS KIDS tasked Planit with reimagining the old Writers Contest website, which served and continues to serve as the community hub for the contest, giving kids the opportunity to find out more information about the contest, read stories from years past, and contribute their own creative energy. Through innovative design solutions and the addition of an interactive Story Creations section to the website, Planit created a way to keep kids engaged with the website year round, even after the contest ended. The redesigned and redeveloped site maximizes user engagement and discovery by featuring fun, relevant design that inspires, entertains, and engages with its young audience. The site now serves as an educational tool used in classrooms and at home as a way to inspire creativity and encourage writing among kids. Planit did all the custom illustrations on the site and created a “best of the best” of all the existing artwork from the kids’ stories. One of the new features of the website includes a Story Creation section. Here kids can build their own storybooks using provided assets as well as their own drawing and writing tools, providing a fun experience for children with varying reading and writing skill levels. The long-term plan for this section is to continuously add new assets and educational features that will teach kids basic writing concepts like plot and characters. What is unique about the website is that it serves as a springboard for teaching kids about community and purpose with their online interactions. It teaches kids to have more meaningful interactions in online communities. Rather than simply “liking” a story written and illustrated by another child, users can provide more constructive feedback by sharing what they enjoyed most about each story. Planit won The Baltimore Business Journal’s Social Madness competition in the medium category. After battling it out with Ryleigh’s Oyster and Nacho Mama’s, Planit went head-to-head with Goodwill Industries of the Chesapeake for the Baltimore title. Social Madness is a one-of-a-kind competition that measures a company’s social media engagement. 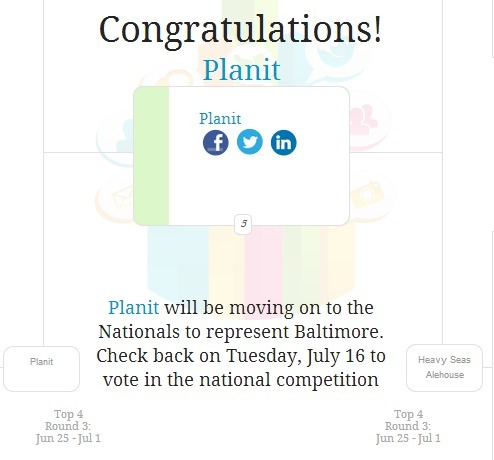 During this year’s competition, Planit received thousands of votes and social media engagement in a three-round bracket-style competition. Proving that Planit is a force to be reckoned with in the Baltimore social media scene. The National competition begins on Tuesday, July 16th. Planit was featured on Maryland Public Television’s “Your Money and Business.” Host Yolanda Vasquez takes viewers on a tour inside the agency and gets co-founders Matt Doud and Ed Callahan to open up about what it’s really like being business partners for almost 20 years. And the Emmy® goes to…Planit! BALTIMORE (June 18, 2013) — Planit was awarded an Emmy® at the 55th Emmy® Awards Gala for its commercial campaign for The Walters Art Museum. To view the commercials, click here and here. “For nearly two decades, Planit has been respectfully disrupting audiences on behalf of our clients and these TV spots further demonstrate our success with that,” said Matt Doud, president and co-founder of Planit. “We are thrilled to win such a prestigious award for our work with this internationally renowned institution. Our goal was to bring the curiosity, discovery and excitement that people experience when they visit The Walters Art Museum to life. Obviously the Academy thinks we succeeded,” Doud added. 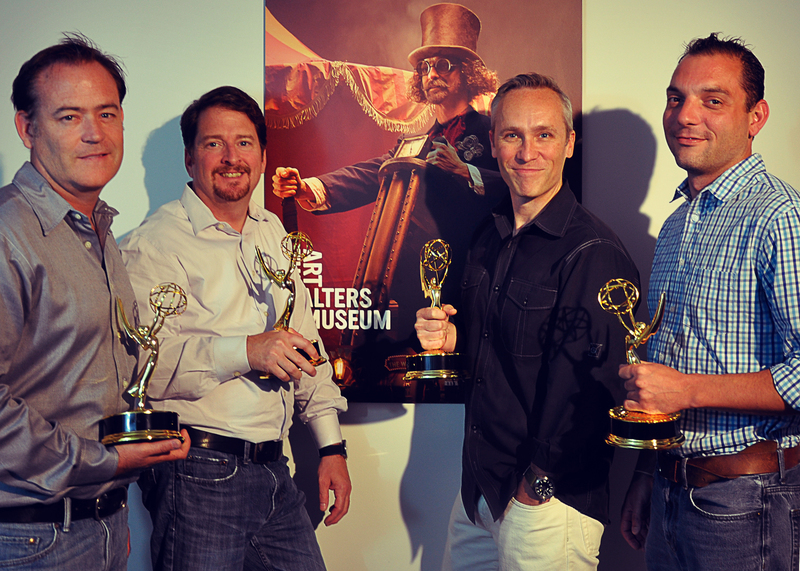 In addition to the Emmy®, Planit also won four Telly Awards for The Walters Art Museum commercials. The Telly Awards honor the best film and video productions, groundbreaking online video content and outstanding local, regional and cable TV commercials and programs. The Telly Awards Planit took home include: “A Palace Inside,” Barker Campaign and “Meow, I’m Dead” in the Not for Profit category and “Palace Inside” for the Cinematography category. Planit was also recently awarded seven Gold and two Silver district ADDY® awards, more than any other Baltimore firm. BALTIMORE (April 5, 2013) — Apparently Planit was listening to mama when she said knock you out. The Baltimore-based integrated marketing firm knocked it out of the park, taking home 31 awards at the 39th Annual American Advertising Federation of Baltimore ADDY® awards, held last night, Thursday, April 4, 2013. The ADDY awards are an annual celebration of the Baltimore community’s talented advertising communications professionals. Highlights of the 31 awards won by Planit, by far the majority winner of the night, include seven Gold ADDYs and five Silver ADDYs for their work on the Maryland State Fair “11 Best Days of Summer” campaign and five Gold ADDYs for the “Lead Isn’t Pretty” campaign for the Law Offices of Evan K. Thalenberg. Other awards the agency received were for work for clients including Island Def Jam, New Horizons, WTMD and Tessemae’s All Natural. Planit joined 41 other agencies at the Hyatt Regency Baltimore on Thursday for the 39th Annual American Advertising Federation of Baltimore awards showcase, which incorporates a different theme each year just as imaginative as the individuals in attendance. This year an old-school hip-hop theme took center stage, with Planiteers dressing the part in velour track suits, gold chains and high-tops. To see photos, click here. This annual event invites area advertising professionals to compete in a variety of categories awarding creative excellence, continuing the organization’s mission to promote and raise awareness for the regional advertising community. For more information on the American Advertising Federation of Baltimore and a complete list of winners visit www.baltimoreadvertising.com. Baltimore, Md. (March 12, 2013) — Planit today announced it has been selected by the Baltimore Area Acura Dealers Association to develop and execute its Tier 2 strategic marketing campaign for the Baltimore area. The $1 million yearlong campaign, set to launch in April, will mix digital and social media initiatives with traditional broadcast marketing to drive leads to the association’s Maryland-based dealers—Norris Acura West, Frankel Acura and Criswell Acura. Planit, a Baltimore-based integrated marketing and communications firm, is proud to announce that its director of client engagement, Sarah Quackenbush, has been elected president of the American Advertising Federation of Baltimore (AAFB). In her new role, Quackenbush will oversee the executive director, officers and board members, as well as the nine AAFB committees. She has been elected to a two-year presidential term by the club’s general membership of about 500 advertising and industry-related professionals. An active member of the club since 2006, Quackenbush has previously held the position of vice president and has served as the chair of several committees including the scholarship committee, the bylaw committee and the ADDY Awards committee. Her primary responsibility as president is to grow the club’s membership while strengthening the connections between the AAFB and the local advertising community. As an award-winning copywriter, Quackenbush comes into the position with a wealth of knowledge gained through more than 12 years of experience in the advertising industry with clients such as CoverGirl, Phillips Frozen Foods, Toyota, McCormick, The Maryland Jockey Club, Royal Building Products and The Economic Alliance of Greater Baltimore. In her current role at Planit she fosters relationships with prospective clients, resulting in new business for the agency. Additionally, Quackenbush assists in the development of new strategic solutions for existing agency clients and manages those relationships across project life cycles. The AAFB is the Baltimore Chapter of The American Advertising Federation (AAF), the nation’s oldest national advertising trade association, and the only association representing all facets of the advertising industry. Headquartered in Washington, D.C., the AAF acts as the “Unifying Voice for Advertising” throughout its 15 district operations, each located in and representing a different region of the nation. The AAF’s membership is comprised of nearly 100 blue chip corporate members comprising the nation’s leading advertisers, advertising agencies, and media companies; a national network of nearly 200 local federations, representing 40,000 advertising professionals, located in ad communities across the country; and more than 200 AAF college chapters, with over 6,500 student members. The AAF operates a host of programs and initiatives including the Advertising Hall of Fame, the ADDY Awards, the National Student Advertising Competition, the Mosaic Center on Multiculturalism, and summer Ad Camps for high school students in Chicago and Washington. More information about the Baltimore chapter can be accessed via their website at www.baltimoreadvertising.com. In order to effectively communicate the newly revitalized wUSa*9 message, the station tasked Planit with creating a :30 commercial that had its inaugural run during Super Bowl 47. The New York Times highlights the launch of the NPR pilot campaign developed by Planit. The three-month campaign includes billboards, television spots, social media outreach, and rail, print and digital ads. Read more at The New York Times here. Baltimore, Md. (February 11, 2013) — Planit announces that it has been selected by National Public Radio (NPR) to develop and execute a campaign to increase its loyal listener base and mobilize them to tune in to NPR member stations. The teams will join forces to launch the four-month campaign for NPR affiliate stations in four pilot U.S. markets—Dallas/Fort Worth (KERA-FM), Indianapolis (WFYI-FM), Orlando (WMFE-FM) and San Diego (KPBS-FM). The marketing campaign is funded by a $750,000 grant from the Ford Foundation, long a supporter of NPR and public radio stations across the nation. As the radio industry shifts toward online listening, the tune-in campaign is helping NPR become even more relevant by attracting new listeners and inspiring them to tune in to their local stations for NPR’s renowned educational and cultural news stories. The Baltimore Business Journal recently turned to Planit co-founder and executive creative strategist Ed Callahan for his insight into the recent growing demand for long-term advertising strategies among companies who survived the recession. Inc. recently asked its Facebook community to submit photos of the world's best offices, and then put them to a vote. 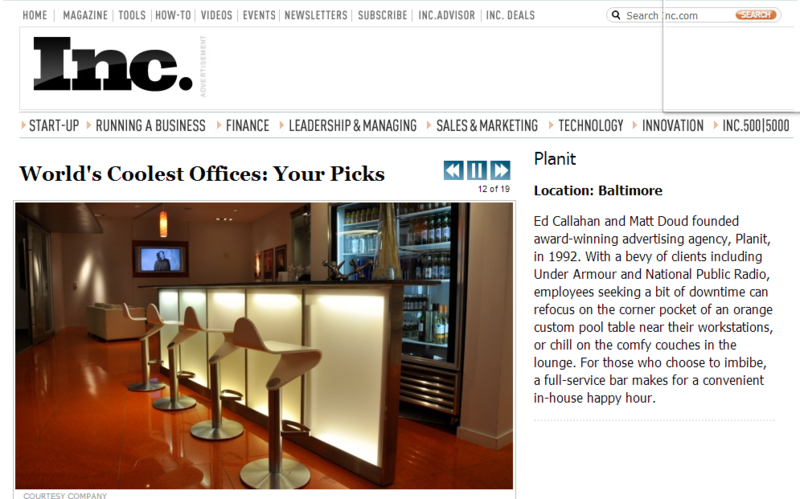 Planit was lucky to rank high enough with fans to earn a spot as one of the world’s coolest office spaces! Check out this awesome recognition here.